This manual describes a procedure for creating a simple "eye" survey of a field study site leading to a large-scale map of the study area. It contains several different techniques of complex surveying including: field sketching, a method of detour, polar method, a method of intersections and a method of perpendiculars. Conducting ecological field studies creates the need to plot observed objects, phenomena and sites on a map. That, in turn, entails mastering skills of correct map-and plan making and their proper usage. The simplest methods of field site survey are usually applied in the course of ecological studies; they do not require special equipment or precise instruments. Such studies usually involve large-scale surveying, i.e. survey of small field sites with high detail. A draft, where a horizontal projection of a small site is taken as being flat and plotted in a reduced and similar form is called a plan. A draft, where a large site or the whole area is plotted taking into consideration its general contour or relief, is called a map. A survey that allows a person to make a plan or a map without taking into account relief and crookedness of the surface is called plane survey. A survey that allows the study of heights of certain sites is called vertical surveying or leveling. Students will master the simplest skills of plane surveying with the help of only a compass and by counting steps at the given practical part of the lesson. They will not require any other equipment or instruments except a tape measure and a stable flat surface. The lesson should begin with some instruction: students should review concepts of a plan, a map, scale and conventions, which have been learned earlier in the lesson devoted to orienteering (Lesson #1, fall). 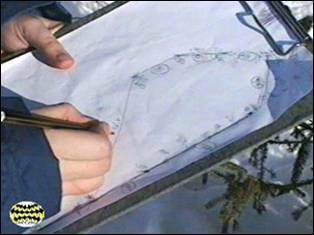 The introductory or theoretical part of the lesson should contain an explanation of techniques for eye surveying an area – making a field sketch, a method of detour, a polar method, method of intersections and a method of perpendiculars. The subsequent fieldwork will likely include all or some the above-mentioned techniques depending on the structure of the area and objects for surveying. Each of the techniques is described below in corresponding chapters. Students should again master the practical skills of angles (azimuths) measurement (reminder: an azimuth is an angle between the direction to the North and the direction to the desired object, which is measured clockwise) as well as skills of distance measurement by counting steps (see Lesson #1, fall). Objectives of the present practical lesson include making a plan of the site in the immediate vicinity of the school or ecological field study center, onto which the main landmarks are plotted: forest tracks, water-bodies, roads, paths, forest cuttings, buildings, power transmission lines, etc. The size of the site for surveying depends on the number of students who accomplish the task and the structure of the site, i.e. the “simplicity” of the given area. Students usually work in groups of 10-12 people in the Ecological Field Study Center “Ecosystem," which is located in a forest massif. They make a survey of part of a forest site that measures 500 m x 500 m. At the same time, a group of the same number of students conducts a survey of another site, located in the river floodplain, with a size of only 50 m x 100 m. It is obvious that the time spent on surveying depends on the number of details that have to be plotted on a map. There are only two glades, one path and four forest cuttings along the perimeter of the forest site, whereas a small site in the floodplain contains a meandering shoreline, a stream, several paths, a lake, a slope of the terrace located above the floodplain, etc. In other words, the teacher determines the size of the site for surveying according to the complexity of the task. The number of students who work together also depends on the structure of the site. When surveying a complex site, for example, a river floodplain, it is optimal to divide the group into teams of 3-4 students. Each team should be given a certain site for surveying so that the surveyed sites can be combined into one general plan of the area at the closing part of the lesson.